From left, front row, Dr. Ora Gelb, Judith H. Sherman, and Ilana Gelb. Back row, students Binyamin Friedman (Teaneck), Ezra Fishman (Fair Lawn), Jason Katz (New Milford), Gavi Berger (Teaneck), Yonatan and Ely Kaplan (Teaneck), Ariel White (Highland Park), Jared Mayer (East Brunswick), Yehuda Yeger (Monsey), Tzvi Machlin (East Brunswick), Chaim Sinensky, (Teaneck), Tzvi Wiesel (Bergenfield), Charlie Wollman (Teaneck), and Binyamin Segal (Manhattan). 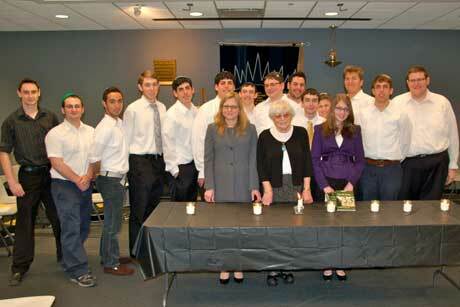 The Torah Academy of Bergen County’s Yom HaShoah program included presentations by keynote speakers as well as students. Offering a student’s perspective was senior Ezra Fishman, while fellow seniors Yehuda Yeger and Jason Katz presented a poem and a picture. I am barely alive within this cold steel. Introducing a scent that sickens my soul. Scrambling to escape this miniscule prison. Shivering, shaking, yearning for home. We did not fool ourselves. I don’t know this girl I screamed! She is MY daughter, another cried! Just spare her the pain! My little Anna has her chance to live. On November 8, 1996, I learned about the Holocaust for the first time. My teacher, Ms. Judy, read us a story, a children’s book, about Kristalnacht. We then discussed how it must have felt to have gone through such a traumatic event. This was over 13 years ago. For 13 years, every year, I’ve been taught about the Holocaust. Though, for some, this number may be small, the idea remains the same: for almost our whole lives, we’ve been taught about the Holocaust, a tragedy almost unrivaled in world history. But why? What are we really learning? Are we learning from the mistakes our grandparents made? Are we learning how to avoid similar types of persecution? We’ve been persecuted for thousands of years; what makes the Holocaust different? Are we learning about how to see the world? Are we supposed to react to every event around us as another event that could lead to a Holocaust? How can we go on every day looking over our shoulder, wondering if another Nazi party is coming to get us? Are we learning it for the sake of the stories? If so, why these stories? Why these people? Why are the stories of those who were brave, those whose lives ended in tragedy, and those who survived so much more meaningful simply because they lived during the Holocaust? There must be more to it. There must be a reason, a message, something for us to internalize from all this. Like most questions, there isn’t a single answer for everyone; but I’d like to share mine with you. To me, learning about the Holocaust is about all of these, and so much more. Those who forget history areabsolutely doomed to repeat it; the world is a scary place to live; these people, these sources of great light in a time of darkness, are absolutely important to learn about ““ but there’s something more, something much more important. 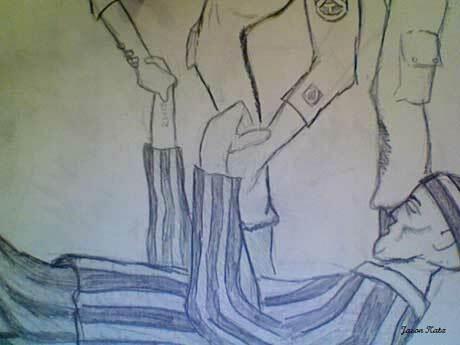 To me, the lesson of the Holocaust is to keep an eye on the Holocaust within us. We, the generation of the future, have a raging fire within us; it’s a fire that burns bright, a fire that consumes us without us ever knowing it. It swallows our past; who cares what happened 1000 years ago, before they knew better like I do? It swallows our faith; who needs g-d when I have the internet? Most of all, it swallows our fellow man; why should I treat others with respect when I’m better than they are? I’m smarter, I’m younger, I’m richer, I live in a better place, my g-d is the right g-d. We throw these into the fire, let them burn away, and then we brush the ashes away, as if they’d never been there in the first place. Only by remembering what happened when one man’s desire to make a new future caused him to lay waste to the world and to murder 6 million innocents, simply for being Jewish, can we remember how important it is to not let our own desires and goals lay waste to our own souls. You are about to hear a moving song which illustrates this message perfectly. One night, a man has a dream. He dreams he is in heaven, with the 6 million holy souls who lost their lives in the Holocaust. He desires in all of his heart to stay, to be with those he lost. But in the end, he must return; it is his job, along with all of us, to remind the world of the Holocaust and its effects, and to help the world build a brighter, safer future.